Rather than that bossy slogan ‘Sort it out’, I wish Wasteserv would promote the fact that the rubbish we throw out is worth money. If people are aware of the value and cost, they’d put more effort in their waste separation. We picked up our organic bin last week. We gingerly placed it on the kitchen worktop and then everyone proceeded to practise the art of pretending that it was not there. It’s even affected the kitchen choreography. We were used to taking two steps to the right to throw away stuff, and now we have to turn to the left and take two steps to the other side. Funny how a new bin and new waste separation instructions can change your routine. We’ll get there eventually. First, though, we had to solve a major problem: the biodegradable bin liner. The other day, I threw away eight rotten oranges in this wispy bag; it groaned and promptly tore from the seams. By the time I took it outside on the pavement for it to be collected, juice had started seeping out. Was I meant to put two oranges per bag? Wouldn’t that mean that we’d all be building little mounds of rubbish outside our doors every morning? I’m all in favour of any bio­degradable plastic because it disintegrates quicker than conventional plastic, but this was just not doing it for us. Oh, the stress! The next day I phoned Waste­serv, and they very kindly told me that it’s absolutely fine for now if we use non-bio plastic bags for organic waste, as long as they are transparent and white. That made things infinitely better – at least until we regroup, retrain and hopefully even create a garden compost. We all need to be determined to get this waste separation right. Earlier this year Eurostat re­vealed that each person in Malta wastes an average of 647kg per year. That’s about as heavy as four panda bears. I kept imagining myself sitting in the middle of four cute pandas and then, in the manner of a horror movie, these cuties start turning into piles of rubbish. Argh! I never, ever realised that I throw away so many things. Luckily 80 per cent of my 647kg household waste (that’s three pandas) can be recycled – and this white, green, black is a step in the right environmental direction. However, rather than that bossy slogan ‘Sort it out’, I wish Wasteserv would promote the fact that the rubbish we throw out is nowadays worth money. 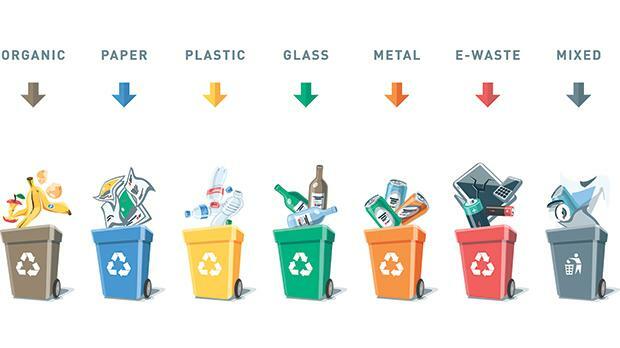 For example, recycled aluminium rubbish (kitchen foil, cans of fizzy drinks, etc) is worth about a €1,000 a tonne – way cheaper than creating aluminium from scratch. A tonne of old Sunday Times of Malta newspapers is worth about €90 when sold for recycling. If people are aware of the value and cost, they’d go “Ilallu!” and put more effort in their waste separation. Perhaps we need to be told the stories behind each bit of rubbish. Take a bottle of water, which symbolises the throwaway world of the early 21st century; like all other plastics, it needs oil to be produced. This means that limited resources are being dug up, at great environmental and social cost. Perhaps if we all knew the story, we’d be eager to install a water filter and drink from a good old-fashioned glass. Wasteserv also need to explain to us how waste separation (when done properly, of course, and not everything chucked in the same truck) reduces the costs of getting rid of rubbish – no need for landfills, incinerators and so on. The saved money could go to local communities and spent on creating public green spaces (provided that the government understands the words ‘public’, ‘green’ and ‘spaces’). Simply telling us to get on with it won’t cut it, especially with my gene­ration. Surveys in EU countries show that the generation that had just come out of the hardships of war – people in the 65-plus age group – recycle more compared to 25- to 44-year-olds. Whereas we are the throwaway breed. Maybe if we make an effort, the younger genera­tion, the under-25s, will be more frugal with their waste. The government is certainly not leading by example when it comes to wastage. It’s been squandering reams of hoarding around the Great Siege monument in Valletta for over two months now. The hoarding – the green one has been thrown out and a larger-scale yellow one put in place – is an attempt to stop people leaving candles and flowers – you know, those scary, threatening weapons in a fight for justice. But flowers and candles keep coming. Soon they’re going to have to hoard off Republic Street, the Law Courts… and why not the whole of Valletta? These antics are an attempt at making people look the other way, while members of government receive hefty kickbacks or hobnob with hitmen of an assassinated journalist. But that’s why we’ll keep on lighting candles: they throw light on all the lurking, dark shadows.